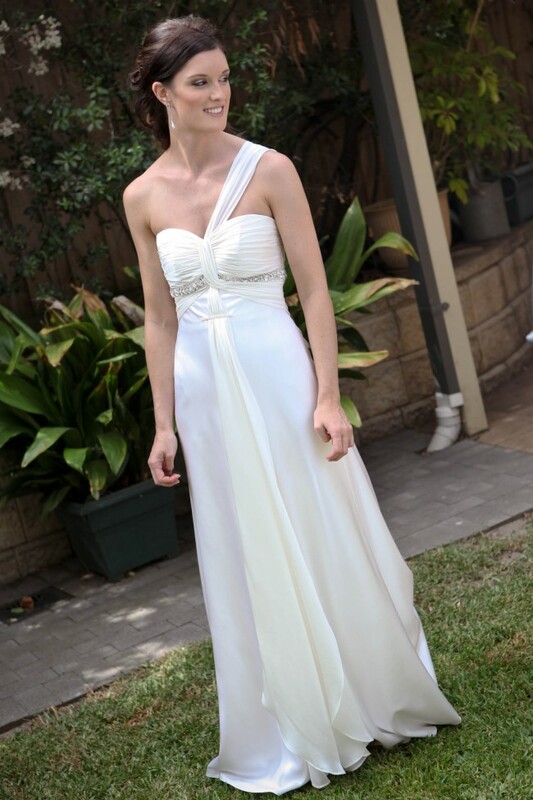 I am selling my stunning Luci Di Bella dress that I wore on my wedding day in 2011. I absolutely loved my dress and planned to pass it down to my future daughter but I now have 3 beautiful sons so I’ve decided to sell it. Whilst it is a few years old, the dress is timeless and similar to current styles around. This truly elegant Georgia gown is made in ivory silk satin and silk georgette. The one shoulder is sophisticated and the dress is fully corseted with a bias cut overlay. The back has a concealed zipper, and covered silk buttons at the top, creating an elegant look from the back. The dress was ‘made to measure’ but I am normally a size 8. On the day I wore 7cm heels and I am 173cm tall. I did not need to wear a bra as it is all structured to fit (I am a B cup) and the train can be easily bustled for the reception. It was so comfortable to wear and I had no trouble dancing and sitting in it. My dress has been professionally dry cleaned at Syndal’s Bridal Dry Cleaners. It is housed in the Luci Di Bella full length dress bag and is available to try on.